The first characteristic is depth. “Depth is where the fish are,” Hughes says. “You must select a lure that will go to that depth to be successful. Many anglers think crankbaits run deeper than they actually will. 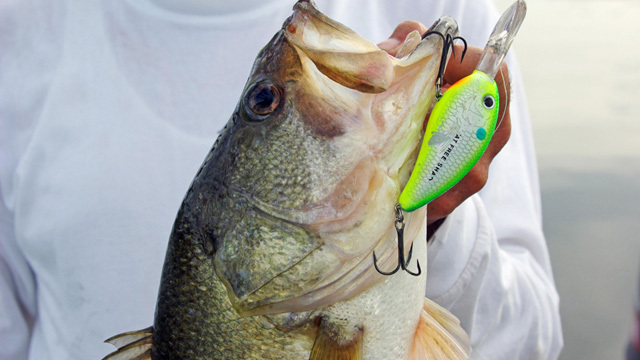 The second crankbait characteristic, speed, is closely tied to depth. “Speed affects depth,” Hughes says. “That’s why it’s important to look on your reel to determine its speed. Some reels are slower, like 3.8:1 (line circles the spool 3.8 times for every turn of the reel handle). Others are high-speed reels with a 7:1 ratio. Others fall between the extremes. Action is another important crankbait characteristic. Characteristic four is buoyancy. This determines whether a lure floats (positive buoyancy), sinks (negative buoyancy) or suspends (neutral buoyancy). Color is the characteristic anglers probably give the most consideration when selecting a crankbait. According to Hill’s research, red also is a top color. Hughes’ thoughts on size, the sixth characteristic, also offer unique insights for crankbait anglers. Many of us were taught that catching big fish requires big lures, but Hughes says this isn’t true. Shape is less important than most other characteristics. Sound/vibration is the eighth characteristic of crankbaits. Though Hughes includes scent as the final characteristic on his list, he says this one has little importance when fishing crankbaits for bass. Hughes developed his list of crankbait characteristics only after a great deal of thought and research. Don’t get bewildered by the many varieties of crankbaits available today. When making a purchase, or when selecting a crankbait to fish with, take Joe Hughes’ list of crankbait characteristics and give them some thought. You’ll find you’ve put an end to crankbait confusion.